Imagination is a life force not unlike procreation. It’s hard not to recognize (see The Background Story) how adept Nancy was at contrasting incompatibles and producing novelties in her writing, in her artwork, and in her life. It was a labor of love for her, and grew out of her lived experience as a child of privilege and abuse. Her friendship with Jimi was a novel, if not alchemical, transmutation of base elements into a valuable tapestry. At the very least, their relationship was a study in contrasts. She was a rubenesque Jewish redhead from New York city once married to a department store heir. 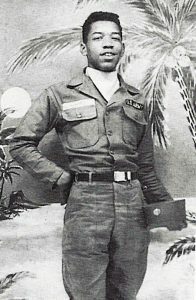 He was a lean, African-American boy from a fractured family on the west coast who chose to be a paratrooper in the U.S. army rather than go to prison. Both were children of broken homes, and both used their art and creativity to lift them out of deep-rooted despair. They must’ve recognized this in each other. Nancy and Jimi no doubt grew together. They wrote poetry together. Simply put, they enjoyed each other’s company. I can’t speak for Jimi, but it is quite clear that Nancy found happiness when she spent time with Jimi, that is, most of the time. Nancy on a beach with a friend from high school. I never felt like a free-wheeling youth once the scars [of childhood] began to appear. But I tried to remember what playing felt like and smelled like and looked like and sounded like, and at Monterey, I came close. Sweet little tinkerbell hippies were handing flowers out to the cops. John Phillips, of the Mamas and Papas walked around in a big fur hat. Nico and Brian Jones strolled along under bangs looking beautiful. And as Jimi and I lolled on the grass like two kids on a campus lawn, it felt like recess. As an artist, and as a friend, Jimi channeled magic into Nancy’s lived experience. Jimi was a paratrooper at one point. But maybe the dynamic remained. The chute opening was the difference between life and death. The leaps were always paramount. Having to perform on level ground required no leap of faith. For a poetic view of the importance of leaping, see W.H. Auden Leap Before You Look. Even on level ground, Hendrix leaped naturally, making the effort of reaching unnecessary. Jimi didn’t seem to reach for things. He seemed to naturally extend. Jimi looked like liquid spilling. He had a speaking voice like bedroom slippers walking over a plush carpet. I felt like I had just watched van Gogh cut off his ear. Good one Jerry. Guy Clark eh? Don’t know him.